7. December 2018. - 20. January 2019. Linked to the Mûcsarnok’s exhibition about lifestyle reform, titled Hidden Stories, Orsolya Drozdik’s show, mounted in one hall of the museum, revisits some of the elements of her earlier project, Individual Mythology (1975–1977). Two series will be on view: the 24 photographs of Individual Mythology No. 4 and those erased drawings of Individual Mythology No. 6 that have not been displayed thus far. The original series was inspired by a film about Isadora Duncan, launched in 1975, and a televised interview with Valéria Dienes. 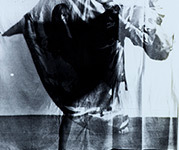 Drozdik used a variety of mediums in her project, including photography, drawing and text as well as performance art – a novel genre at the time – along with photos documenting it, and offset prints. These innovative gestures brought her a sense of freedom, further enhanced by the potential movement between the different media. Drozdik began work on her cell-paintings in 2017 in Paris and continued it in New York and Amsterdam. The large canvases included at the exhibition, titled CellMovements, were painted in Budapest. The entire series is permeated with the affirmation of life and an exuberant life force. Cells are the tiniest living units of life and are in constant motion. The five canvases, each measuring 1.6 x 4 metres, do not show the cells but rather their movement and vibrant undulation.